Our range of cufflinks are handmade in our workshop. They are silver tone and topped with domed glass. Each pair comes in it’s own presentation box. The insert of each cufflink measures 18mm. 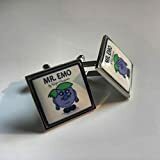 All our cufflinks are totally unique as we design and make them ourselves.